NEW Fastrack® PRODUCTS for Dogs, Cats and Horses on this page. Michigan Microfeeds, LLC Customer Referral discounts, and Commercial Purchaser programs apply to all products on this page in addition to our other line of great Fastrack® products!!! Contact us for the latest sales and special offers information bldhd@cbpu.com (click on email address). Let's treat "Man's Best Friend" to the best in canine nutrition!!! Fastrack® Canine Treats are healthy treats that your dog will beg for!! They contain some of the same beneficial bacteria found in Fastrack® Canine Microbial Supplement and Fastrack® Canine Gel. In addition to beneficial bacteria, Fastrack® Canine Treats are made with vitamins C & E, pork and poultry liver, prebiotics and linoleic acid prebiotics. These treats are easily carried in pocket or purse with NO GREASY spots on clothes or equipment. The tablets can be broken in half for the smaller breeds and medium breeds of dogs. 60 squares per bag. *Chelated minerals *Vitamins *Vitamin C (Ester-C®) *Glucosomine HCL, green-lipped mussels and MSM. 60 tablets to each jar. Suggested retail: $40.15 per jar or $208.95 per case of six jars. Fastrack® Feline Microbial Supplement is the foundation product of beneficial bacteria that boosts the health and performance for cats of all ages, from kitten to adult. You will see the difference in activity, hair coat quality and less digestive upsets. This is the first time Fastrack® has been available in a formula especially for your feline friend. 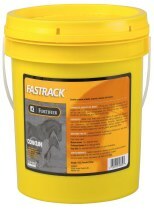 Fastrack® Fortifier gives the extra edge to the equine athlete. Farm, kennel or personal use dealerships available for added discounts. Please feel free to contact us for more information. Shipping and applicable sales tax applied to all orders. Contact us for discounts and farm, kennel or retail sales promotions. Prices subject to change without notice. Click on the shaking bloodhound to email us for further information. Fastrack® is a registered trademark of the Conklin Company, Shakopee, MN and Michigan Microfeeds, LLC and Canadian Microbials are Independent Business Owners. Canadian Microbials has exclusive distribution for Fastrack® Canine and Feline products in Canada.